The Cumberland & Dumfriesshire Farmers Mart held their annual sale of Spring born suckler calves with a catalogue entry of 580 at Longtown on Saturday 22nd October. A packed ring of buyers ensured a flying trade was had throughout with vendors being delighted with there returns. The sale saw the average lift £118.57 on the year. Judging was ably carried out by Mr. Martin Graham, who awarded the Jacob Thomlinson Challenge Trophy to a Limousin heifer from DH & JM Murray, The Throp and later realised £850. 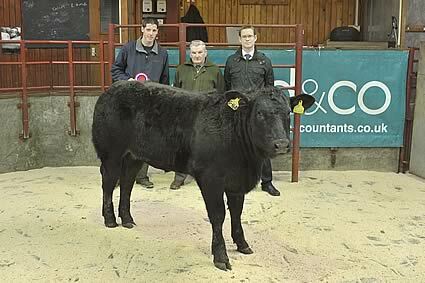 The reserve champion also went to Messrs Murray for a Limousin heifer which sold at £920 both being purchased by the judge. Mrs Laura Thomlinson presented the Jacob Thomlinson Memorial Cup on Saturday at Longtown. She has presented the cup for the last 30 years in memory of her husband Jacob who was an Auctioneer and Director of the Company. 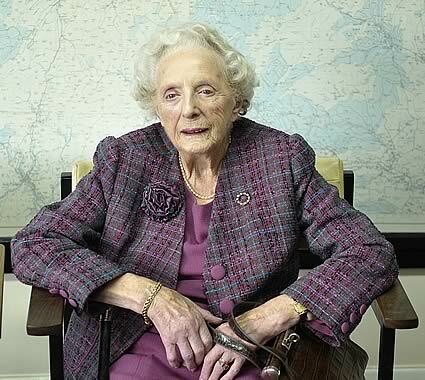 Mrs Thomlinson was 100 years old on 5th October and has always had a very keen interest in the Company. She lives in Carlisle with here daughter Hazel, who both support the mart in many ways. Any other Cont. bullock: 1st, 2nd & 3rd Greystoke Castle. The highlight of the sale was an excellent run of 154 Charolais calves from Greystoke Castle Farms with bullocks selling to £870 and averaging £732, with the heifers to £770 x 2 and averaging £679. Charolais: £970, £960 Riggfoot, £945, £905 Barnglieshead, £870 Riggfoot & Greystoke, £860 Barnglieshead, £840, £810, £800, £770, £760 Greystoke Castle. Limousin: £1045 Standingstonerigg, £970, £945 Becks, £945 Riggfoot, £860 Rinnion Hills, £850 Becks, £840 Midtodhills, £835 Riggfoot & Ryeclose, £830, £820, £815 The Throp, £810 Greystoke, £770 Woodside. Charolais; £900, £890, £880 Barnglieshead, £780 Highparkfoot, £770 Riggfoot & Greystoke Castle, £765, £750, £745 Greystoke Castle.